You Can Now Get Botox at the Dentist! Botox. It’s likely a word that you have heard before, mostly in the context of celebrities using it to eliminate small wrinkles on their face and neck. While Botox has been used successfully in a cosmetic context for many years, did you know that your dentist can actually utilize it to treat chronic jaw pain and teeth grinding as well? Today, we’re going to tell you everything you need to know about Botox and how it can do more than simply help you look younger. Everyone has a general idea of what Botox is, but do you know what it’s actually made of? “Botox” is short for botulinum toxin, which is a kind of protein produced by a bacterium called Clostridium botulinum and other related species. When introduced to the human body, it prevents the release of neurotransmitter acetylcholine from axon endings at the neuromuscular junction. Said in more plain terms, it causes temporary paralysis in the muscles. 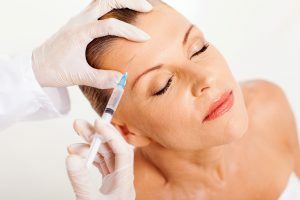 Over the decades, doctors and dentists alike have been able to refine Botox into a form that is able to serve people in a number of ways. This is the use that most people are familiar with. When applied to the facial and neck muscles, Botox is able to quickly lessen and eliminate the appearance of small wrinkles in the skin, able to provide results that used to require invasive cosmetic surgery. Botox is typically administered with a few painless injections in strategic areas of the face, and this prevents the specific muscle movements that cause the skin to wrinkle and crease, creating a smoother, more youthful appearance. In the past, it was mostly used by plastic surgeons, but now, with special training, dentists are able to successfully apply it as well to give their patients a youthful glow to go with their beautiful smile. Afterward, the results can be expected to last for a few months before another treatment is needed. Less well known is Botox’s ability to provide relief from chronic teeth grinding. Bruxism is a condition where a person unconsciously clenches their jaw and grinds their teeth, and most of the time, this occurs while a person is sleeping. Left untreated, this can severely damage the teeth and even strain the sensitive jaw joints. Fortunately, Botox can actually be injected into the jaw muscles to prevent the unconscious movements that cause the teeth to grind together. It can also be used to relieve pain related to the jaw joints, known as the temporomandibular joints. Dentists have been using Botox in this context for years, and it gives them another option to solve a very common problem. Whether you’re considering Botox to make yourself look a little younger or you need help with teeth grinding, Botox can provide a quick, effective, and non-invasive solution. Dentists around the country have been successfully using it for decades, so if yours offers it, you can trust that it will deliver the results you desire. Dr. Masha Kogan is a general, restorative, and cosmetic dentist based in Westport, CT. She has taken endless amounts of continuing education over the years in order to provide a comprehensive array of services, including Botox. If you are interested in getting Botox, she can be contacted through her website. Comments Off on You Can Now Get Botox at the Dentist!